Even a little bit of research into the mysterious text we call the “Emerald Tablets” will quickly leave you baffled. While the translations reveal ancient secrets once known only by Hermetic Magicians, Alchemists and other Initiates, the origins of this work are not so clear at all. Conflicting information, confusing speculation and heated opinion surround the Emerald Tablets text. In fact, depending on what you read or who you trust, this body of work is a mere 1,200 years old … or a whopping 38,000! The Tablets have been described as rectangular green slabs or plaques with exquisite, bas-relief lettering. A lettering which appears similar to the ancient Phoenician script. And while the many translations over the centuries all source their origin from these carved emerald stones, the “original” objects are nowhere to be found … at least not to this day. If there is a set of emerald stones carved with alchemical secrets, where might they be? Some say they’re buried within a vault somewhere on the Giza plateau. Other say they’re within the equally mysterious (and hidden) Ark of the Covenant. 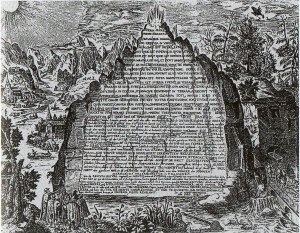 To explain it in the most basic terms, the text of the Emerald Tablets is a summary of the principles of alchemy. It is where the “Secrets of the Philosopher’s Stone” is described. While some argue that the alchemist’s power comes from a formula which literally turns one physical substance into another (base metal to gold), modern day mystics sometimes argue that this is the language of symbolism. “Base metal”, in the language of the mystics, refers to base human consciousness, while “gold” refers to the transmutation of the ordinary human into a conscious creator or enlightened being. Occult history buffs and students tend to agree that the Tablets were originally uncovered around 1350 bce, in a hidden chamber under the Egyptian pyramid of Cheops. But this is not the only tale of their discovery. Another legend tells a tale of Hermes, (not the Roman messenger god of Quicksilver, but a 5th century philosopher) who happened to be traveling in Ceylon (modern-day Sri Lanka). He discovered the Emerald Tablets, so the story goes, hidden in a cave. After studying them, Hermes learned the secret of traveling in “both heaven and earth.” The legend goes on to say that he spent the remainder of his life traveling across Asia and the Middle East serving as both healer and teacher. Another mystery surrounding the Tablets is its author. Some say it was written by an Atlantean Priest-King named Thoth (in an incarnation as Hermes Trismegistus) back around 36,000 bce. Others argue it was one of Adam’s sons, (of Adam & Eve fame), who is to be credited. Still others say it was an Arab named Balinas between the 6th and 8th centuries of our current era, who first wrote down the secrets of the alchemists. What we do know is this: the self-named author within the translated texts is one “Hermes Trismegistus.” But the first appearance of the text that we know of was written in Arabic by Balinas, some time between 500-799 ce. Balinas claims to have uncovered the text within a vault found beneath a statue of Hermes in central Turkey. He also writes that within the vault he found an old man sitting atop a gold throne. This old man held the tablets in his arms. Some Jewish mystics, on the other hand, say that Seth (Adam’s son), is the real author. In the “Seth Origins camp” the Emerald Tablets were later in Noah’s hands, who took them aboard his ark. Following those 40 days and nights, Noah supposedly then hid the Emerald Tablets deep within a cave, somewhere near Hebron. Later, so this story goes, they were discovered by Abraham’s wife, Sarah. Yet another version of the Tablets’ origins tells of Hermes (another of Abraham’s sons) giving them to Moses’s daughter Miriam. Miriam then allegedly placed them in the Ark of the Covenant, where they’re said to remain even today. Despite the mystery surrounding the Tablets (and the origins of alchemy in general), among alchemists today and those in the past there is almost complete agreement: alchemy’s origins lay in the pre-pharaonic land of Egypt. It was a gift from the gods during the “First Time,” or Zep Tepi. 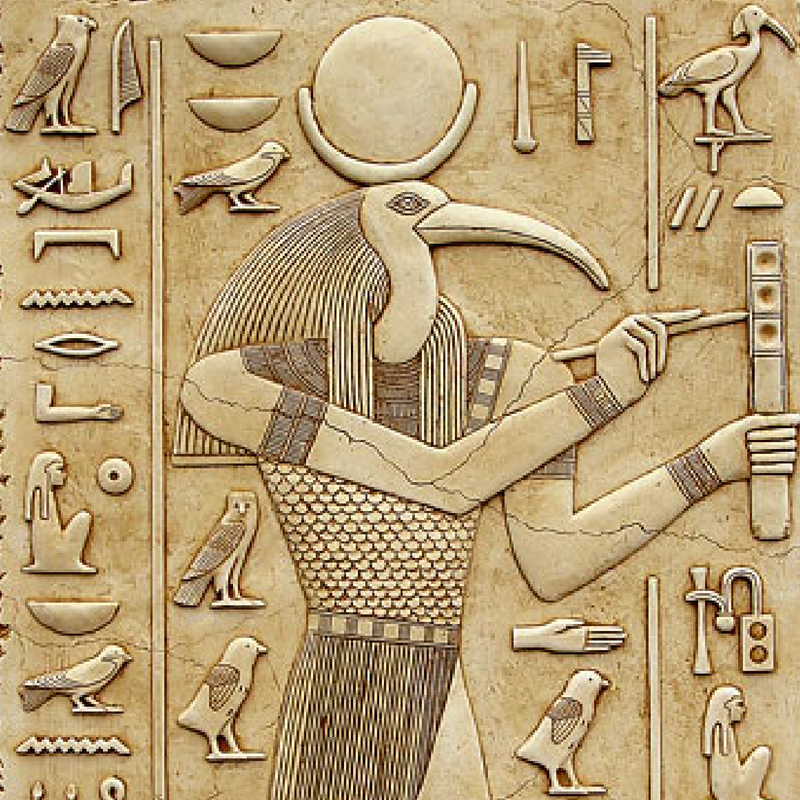 According to this legend, a group of gods or godlike beings arrived in Egypt. These beings shared with the people an advanced technology which enabled them to literally transform matter. 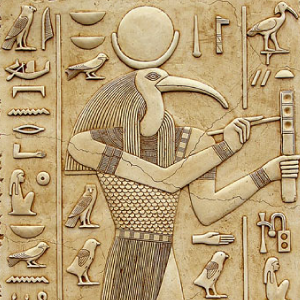 It was during this time that Thoth was said to have crafted or brought the Emerald Tablets to humanity. Exactly when was this “First Time”? … more than 12,000 years ago. Source Book for Egyptian Mysteries and Western Religions? One of the key “truths” revealed in the Emerald Tablets is the notion of “As Above, So Below”. If indeed, the origins of this message come from some long-lost tablets, that means all the wisdom of the ancient Egyptians is itself but a copy of something much older. Could the Emerald Tablets be the source book for both the Egyptian Mystery Schools and all western religious traditions? We know that Judaism, Islam and Christianity all share certain principles which link back to Abrahamic traditions. 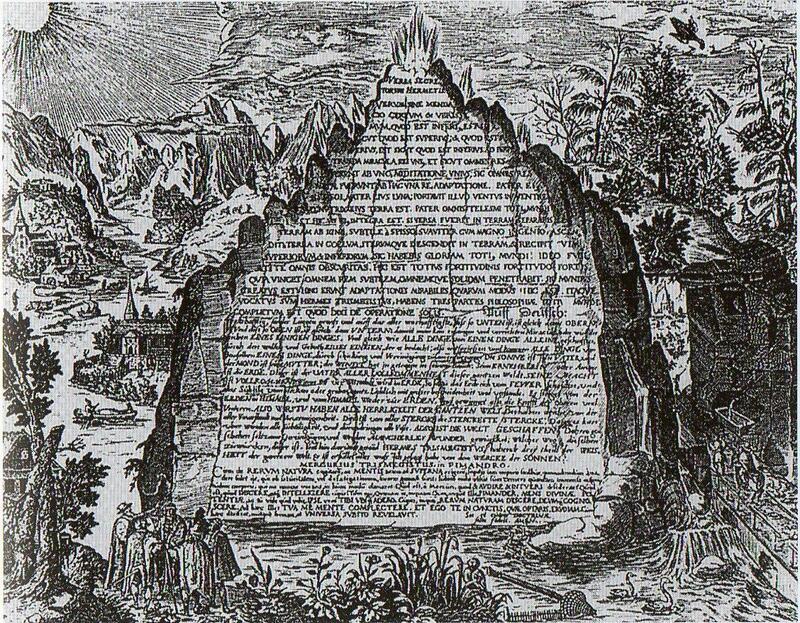 But students of the Emerald Tablets argue that those Abraham-based precepts can all be sourced within the far older Hermetic principles revealed in the Emerald Tablets. Certainly if the principles and mysteries outlined within the Emerald Tablets date back to the “First Time” it would be easy to see how they could have reached and influence the likes of Abraham, Moses and those early Hebrews. But like the rest of the Tablets’ mysteries, we can’t know for sure if their origins truly date back to such an ancient, pre-flood era. However you choose to interpret the texts as they’ve been translated down through the ages, one thing with far less room for interpretation is the existence of the Tablets at all. Despite compelling arguments by sages, alchemists and mystics, we have yet to find (or re-find) the stones. Were there indeed slabs of emerald carved with formulae for magic by an ancient King of a long lost world? If so, where did it go? 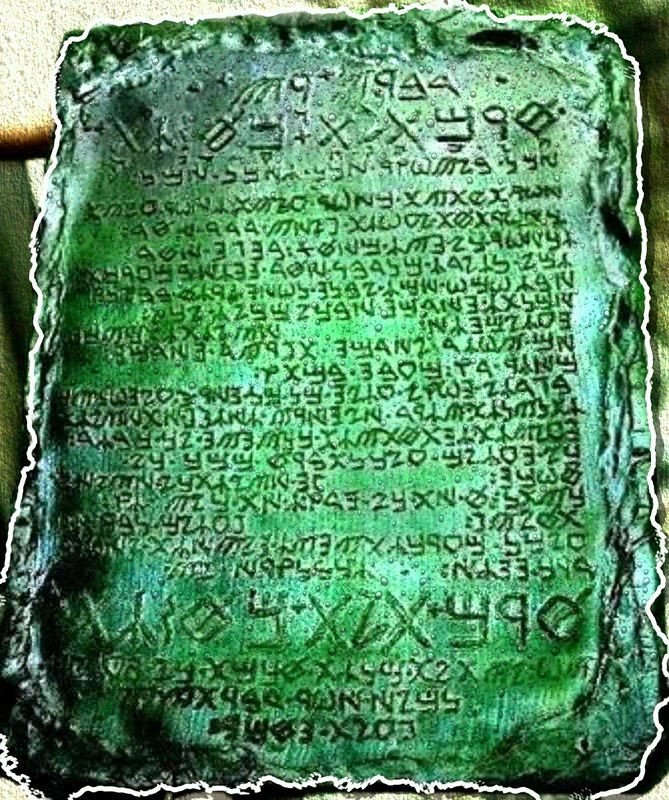 Did translators such as Balinas, Sir Isaac Newton, Aleister Crowley or Albertus Magnus actually see these Tablets? If not, what reason would any of them have to invent a story of its existence at all? Was this some clever ruse to shroud certain factions of society in mystery? To keep the bulk of humanity from asking too many questions for fear of powerful magician’s reprise? Certainly Newton, Crowley and Magnus were all very likely to have been Freemasons, wielding great power in their time. Would whispered rumors of Egyptian magic used by these men as means to another end? We may never know the answers to the mystery behind the Emerald Tablets’ origins, their true nature or even their existence at all. What we do know is that the information as it has come down to us reveals secrets which alchemists throughout the ages had long sought to keep hidden from the world. Information you and I may use to transform matter … or perhaps, even ourselves. What’s your take on the Emerald Tablets? Leave a comment below, we read each and every one.